THE PRESIDENT OF the European Council Donald Tusk and the President of the European Commission Jean-Claude Juncker have published their “reassurance” letter to UK Prime Minister Theresa May. On the eve of the vote on the Brexit Withdrawal Agreement, May is looking likely to lose the vote, with an audit by the Guardian predicting she will lose by 423 votes to 216. 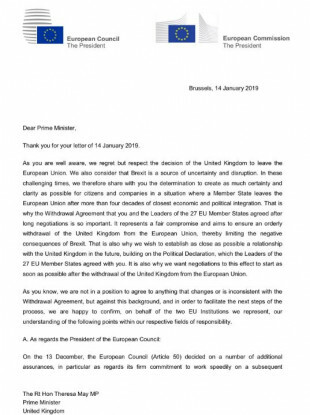 This letter from Juncker and Barnier was hoped to offer enough reassurance in order to get the deal over the line, particularly by offering clarification on the backstop. The letter is in response to a letter from Theresa May to the two leaders, which has also been published this morning. On the backstop, Juncker and Barnier said that if the backstop were to come into force that it would be a “suboptimal trading agreement for both sides”. The letter also says that the Withdrawal Agreement and backstop “do not affect or supersede the provisions of the Good Friday or Belfast Agreement… in any way whatsoever”. It also does not “extend regulatory alignment with European Union law in Northern Ireland beyond what is strictly necessary to avoid a hard border on the island of Ireland”. Were the backstop to enter into force in whole or in part, it is intended to apply only temporarily, unless and until it is superseded by a subsequent agreement. The British Attorney General Geoffrey Cox responded to the publication of the letters by saying that the letters were useful in making a “political judgement” on the backstop. Cox surmises that “the balance of risks favours the conclusion that it is unlikely that the EU will wish to rely on the implementation of the backstop provisions”. …everything the Attorney General said in his legal advice regarding the backstop, still stands, there has been no change to the Withdrawal Agreement, and Northern Ireland would be subject to EU laws with no representation in Brussels. We would rely on the Dublin government to speak up for us. The letter adds that the EU cannot agree to anything that would “change” or would be “inconsistent” with the Withdrawal Agreement, but they could clarify their understanding of the existing agreement. Interestingly, the letter says that the backstop does not have to be the template for the future. In this context, facilitative arrangements and technologies will be considered. Any arrangements which supercede the Protocol are not required to replicate its provisions in any respect, provided that the underlying objectives continue to be met. How likely is this to change MPs’ minds? Speaking to reporters at a press conference at a factory in Stoke, Theresa May said that she had achieved assurances from some MPs that they would vote in favour of her deal despite having previous doubts about it. She said that no one had come up with an alternative plan to her Brexit deal, reiterating previous comments that she made that her deal was “the only deal on the table”. When asked whether Article 50 was extended until June, she said that “we are leaving on 29 March”. The letter from Juncker and Barnier offered assurances that the EU could ratify the deal in time for this date if it is approved tomorrow. When asked whether her deal actually delivered the Brexit that people voted for on 29 March, she said that it did on the basis that it “took control” of immigration and their own money, delivered on an independent trade policy, and took them out of the Common Agricultural Policy and the Common Fisheries Policy. In her letter to Juncker and Barnier, May said that “discussions of the backstop has also exposed some misunderstandings about how it would work if it were ever to be used”. Email “Last-minute letters between Theresa May and two EU leaders have been published”. Feedback on “Last-minute letters between Theresa May and two EU leaders have been published”.